Yippity skippity!! Let's hear it for the 4th of July!! Whats not to love about all day celebrating + glittering fireworks in the sky?! Fourth parties are my absolute favorite parties - they're filled with fanefare but without all the stuffy formalities. Now, just because this holiday calls for easy food - doesn't mean you need to skimp on the wares or the booze! Lock your paper plates + tin foil tins away in the cupboard - instead prop out your table with brightly colored wares in a cluster. Set a glittering + festive feast for the eyes - mimicing that of the nightime display that's set to dance in the skies! Your guests will go ga-ga over your playfully chic summer table - you'll make mixing high and low look totally graceful! Here is some advice from me: setting a spirited spread will really give you a leg up - and who knows, you might even be able to put the keg up!! 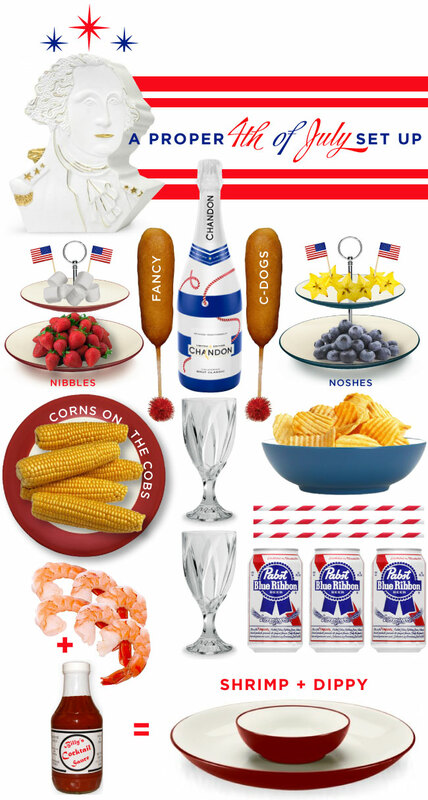 Wanting you some fabby 4th of July table wares?? I've got a special MRS deal that I'm thrilled to share!! Shop Noritake China + receive 15% off on all merchandise - use code MRS15 at checkout + stock up for the 4th of JULY! !